Discussion in 'Theology and Doctrine' started by Botolph, Jun 29, 2016. My purpose here is to move away from some of that which causes controversy, and look at one of the core beliefs so fabulously expressed in article 1. The solid monotheism - 'there is but one living and true God' is something that seems to easily get washed away in the sea of liberalism. Islam correctly asserts this truth, and we should express it just as strongly. I fear that the next part seems to often get forgotten in the maize of helpful understanding about God. 'without body parts or passions' reminds us seriously that anthropomorphic understandings of God just will not pass muster. No Anglican should be left with an understanding of God as the kind old man in the sky. 'infinite power, wisdom and goodness' of course leaves is with the question that has confronted every generation, including Job in the Old Testament. In answer to the challenge of theodicy (the problem of evil) we are unshaken in our acceptance of all three, and we accept that we will not always understand now, and we acknowledge that sometimes this requires trust and faith. And we accept that all things have been created and preserved by God, including both the things we can see, and the things we can't see. And having said all that we affirm the absolute conviction of the Church, expressed in all the councils, and profoundly explored by the cappadocian fathers. We believe in the unity of the Oneness of God there be three persons (not in the sense of human persons) all equally God, all equally powerful, all equally eternal, and we names them Father, Gin and Holy Spirit. A absolutely adore the comprehensiveness and the beauty of the language, the theological straightforwardness. It is one of the treasures of our tradition, not that other Christians disagree with it, but because we say it so well. Andy, CWJ and Madeline like this. We do say it so well, this combination of simplicity and utter mystery. I like the mystery because it reminds me that humility is necessary. This has always been one of my favorite Articles, so bold and firm on God's divine attributes and sheer utter majesty. 1. "I fear that the next part seems to often get forgotten in the maize of helpful understanding about God. 'without body parts or passions' reminds us seriously that anthropomorphic understandings of God just will not pass muster. No Anglican should be left with an understanding of God as the kind old man in the sky." Would you say that the image of the "kind old man in the sky" with body parts understanding represents either a common misunderstanding of God or else a primitive and ancient understanding of him that believers today do not commonly hold to? Take for example the idea of Zeus, who is pictured as a kind of giant man in the sky. It's a very ancient concept. The Egyptians, Sumerians, Babylonians and Hindus commonly portrayed some of their main gods as anthropomorphic beings who lived in the sky. An interesting scholarly question might be whether and how much that affected portrayals of God in the oldest parts of the Bible, particularly the Torah. What do you see the implications of the statement in Genesis that God made man in His image? 2. What are the passions? For example, is love a passion? 1. "I fear that the next part seems to often get forgotten in the maize of helpful understanding about God. 'without body parts or passions' reminds us seriously that anthropomorphic understandings of God just will not pass muster. I think you would have to look at what "passions" meant at the time the articles were written. The meaning of language changes over time. Page 3 of this article talks about what without "passions" might mean. By the way, that article is one of a series on the articles if anyone is interested. Also by the way, I don't necessarily agree with everything said in this article, just thought that the interpretation of without passions was interesting - "not able to be affected or changed by anything we can do"
When Article 1 was written, I think that they had in mind that God in the Torah was by essence not enfleshed yet, nor did he suffer like people do from the Passions, like gluttony. What theologians and philosophers like to do sometimes is that they question whether a statement is correct and look at it from multiple angles. Take for example the filioque. Philip wrote like a deep thinker on this topic, agreeing with the Orthodox view that the Holy Spirit does not proceed from the father "and the Son", since we see in the gospels that in fact it was the Spirit that descended on the Son. Personally, I like to be flexible with language when allowable, so I can see the argument of some western Christians that what the filioque means is that the Spirit proceeds "through" the Son, that is, the Son NOW has the Spirit and sends it on to us. But in any case, this is the kind of theoretical discussion that theologians and philosophers sometimes make. So if a theologian wanted to make the same kind of questioning approach to Article 1, he could ask things like whether now after the incarnation God has a body in the form of the Son's Body, or how God's love, "wrath" and "jealousy" in the Torah relates to the topic of whether it can be said that God has "passions". But anyway I don't think Article 1 is intended as some major point of difference with nonAnglican Christians. Thank you to those who are contributing to this discussion. I share the sentiment that this article is both profound and deep, and as Rakovsky noted, it does not seek to divide Christians, but sets forth in a concise way some things that are held by the one holy catholic and apostolic church, which we understand ourselves to be a part of. The force of phrase, I believe needs to be read as a whole, rather than as three separate statements, though clearly each part of the clause has meaning and builds the composite phrase. Clearly the first force if the statement is to remove God from a sense of physicality. God does not have a body to grow old, time is without constraint in the context of eternity. This notion of God beyond the physical is consistent with ancient Celtic understandings which have not been entirely lost. The concept of the borderlands where time and eternity meet, of the thin places where the earth is so thin that you can see or feel something of heaven, are reminders of a theology that saw God as more, as bigger, as transcendent. This theology of course is not the sole preserve of the Celts, but is represented in Scripture, and the faith of the great councils of the Church. Secondly the article emphasises this in terms of the rejection of parts of God. Terms like the hand of God, the mouth of God, the mind of God, are literary expressions, however in no way are they to be seen as accurate descriptions of God, who does not have a body, who is beyond the physical. God indeed is indivisible. God is never in two minds about anything. You cannot have a bit of God, and you certainly cannot hold the whole of God, but rather in keeping with Augustine of Hippo, we know that God has us. We may love to speak of the love of God, and some delight to speak of the wrath of God, which profoundly may not be all that different. And we see in scripture some striking examples which might be seen to present a very passionate God, as in God who rolls back the heavens and puts on a choir of thousands of angels to tell a few shepherds in a field to say ‘that’s my boy’, however this is not what the article is speaking of. The article is speaking of the dispassionate nature of God – whose actions and thoughts are not weighed by external issues, whose emotions do not get to rule the day, who actions will always be fair and just and true. I think it is a great tribute to the authors of the article and their wisdom, that such profound thinking was apparent at a time when the realm was only just coming out of a period of great upheaval, from the Act of Supremacy, a succession of wives, then the regency of Edward, and a period of some theological turmoil, the restoration under Mary, and then Elizabeth 1 which was long enough to settle things down a bit. Some of what passed for justice in that period may have seem capricious, failed, or ruled by passion. To Rakovsky, let me say, like all of us, I do but paddle in the deep waters of God. alphaomega and Christina like this. Article 1 establishes a fundamental aspect of our faith, namely the faith in the Holy Trinity. Article 2 draws our attention to the person of the Son and our commitment the doctrines of Incarnation and Atonement. We begin the consideration, essentially drawing on the prologue to St John’s gospel (John 1:1-18), which was a big influence on the work of the Cappadocian Fathers which came to fruition in the Nicene Creed as promulgated at the first council of Constantinople. Whilst the Son is begotten of the Father, the Son is eternally begotten of the Father. This is a profound concept, and sometimes perhaps a little more difficult for us in our generation of understand. For us time is a continuum, that is from this point in time, we can go backwards or forwards as far as we like. For a 21st century educated mind, that makes perfect sense. The mind of the ancient word understood that there was a place ‘before time began’, and the end of the world as the time after time ends. In a sense we measure time backwards and forwards from ourselves, and see that length without limit in either direction, whilst the earlier view measured time forward from the moment god said ‘Let there be light’, and saw a point in the future where time ceased to have meaning. Whilst our concept of time has changed, this does not invalidate the truth being expressed in the articles. In the contemporary environment it may be helpful to think of these moments as the moments where time and eternity meet, intersect or are in harmony. The first of those moments is creation, where all that ever has been is called into existence, as Genesis tells us by the word uttered and the spirit moving. Neither to Word nor the Spirit are part of the creation, they are in fact pre-existent or if you like un-create. The writer of the fourth gospel clearly identifies Jesus as the word, who existed eternally, from before all worlds began. The next of these great moments where time and eternity meet in in the Incarnation. The young woman, Mary, says yes to the invitation of God to be part of the solution, ‘I am the handmaid of the Lord, let it be to me according to your word’. The pre-existent eternal Son of the Father is born in our flesh. 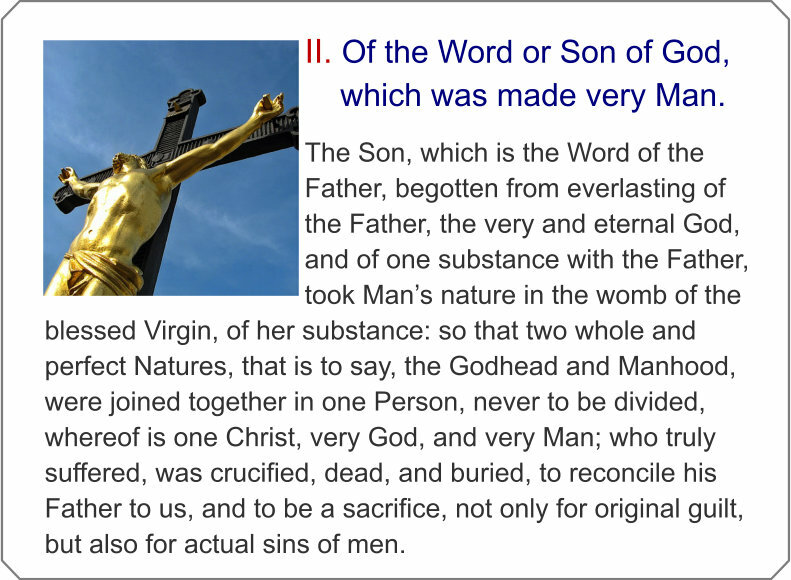 Two complete and perfect natures, one human and one divine, are one Person, Jesus of Nazareth, truly God and truly man. With great dexterity the article has walked past a dozen or more Christological heresies, including, Arianism, Adoptionism, Spanish Adoptionism, Monothelitism, Monoehelitism, Apollinarianism, Docetism, Melchisidechianism, Monarchism, Monophysitism, Nestorianism, Patripatianism, Psilanthropism and Sabellianism. No doubt I have missed a few, however I hope you get the point. Article 2 holds a straight and firm line to the truth of the Incarnation, which underlines our faith in the Holy Trinity and does not detract from it. Jesus Christ is entirely divine and eternal and yet our brother in Humanity. Having drawn our attention to the great and profound mystery of the Incarnation, the article then focusses our attention on the purpose of the Incarnation, which is of course the Atonement, the absolute reconciliation of God and humanity, which indeed Jesus already was. Jesus lived the message he proclaimed. The purpose of the suffering, crucifixion, death and burial is that we might be reconciled to God the Father. The text from 2 Corinthians 5:16-19 seems to be ringing as a clarion bell through the article at this point. The idea that Christ is a sacrifice not only for original guilt, but also for our actual sins underlines the scholarship of the authors, and their familiarity with Anselm’s Cur Deus Homo. The need for sacrifice clearly points to the old covenant, and Jesus fulfilment of the requirements of the Old Covenant is what opens the door for the new and everlasting covenant. Hebrews 4:14-5:10 seems to reflect here as well. The great scholarship of the authors of the article has also enabled them to avoid the temptation to fall into a narrow soteriology or specific form of a doctrine of the atonement. The one point made here is that the sins of humanity as a whole expressed in the fall of Adam, and each of us in our own failing and falling, are addressed in the death of Christ. Article 3 presents us with a number of issues in the contemporary world, and yet, I believe, it challenges us in ways that perhaps we ought to contemplate. Contemporary texts now read, in the Apostles Creed for example, ‘he descended to the dead.’ Where as in BCP 1662 they read ‘he descended into hell’. The argument for this change was that it more closely reflected the true meaning of the phrase in the original Greek. I am not enough of a scholar to debate this point, and I accept the general notion that it is a better rendering of the meaning if the original text. The notion of ‘the dead’ or ‘hell’ is spoken of without a sense of physicality, in the same sense that our perception of heaven is without physicality. There is a remarkable sense of the completeness of the mission of Christ, which happened in time, yet has consequences for all time. I think this article underlines that for us. Towards the close of the amazing account of the interaction with the Samaritan Woman in John 4 in Greek we read ‘Alethos o soter tou kosmou o Christos’ often rendered in English along the lines of ‘Truly you are the Saviour of the World’, though I would feel more comfortable if it was rendered ‘Truly you are the Saviour of the Universe’. Unimaginably the 3rd article reminds us that the atoning work of the Christ extends beyond all our imaginable boundaries, yes even beyond the grave, and in the traditional language even into hell. For many of us, hell represents to notion of the state of existence where God is not. The cry of abandonment from the cross ‘Eloi Eloi, lama sabachthani’ is the cry of a mission that extends beyond anything we are capable of imagining. God’s love for us is such, that not simply to the ends of the earth, but to the very ends of all possibility, he will reach to bring us home. It is possible that the grotesque images of hell that seems to delight many in the middle ages may have coloured the understanding we have of the words that the 3rd article presents us with. JB Phillips told us ‘Your God is too small’, and in a sense that is one of the remarkable messages of Article 3. There are, of course, two words in Greek generally translated as hell in the Bible - Gehenna and Hades. Christ descended into Hades, not Gehenna. Botolph and DivineOfficeNerd like this. 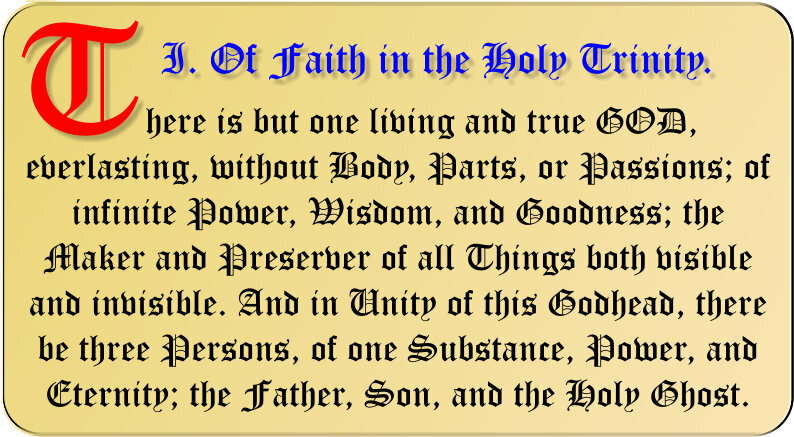 Along with Article III, Article IV is an extension of what has already been expressed in the Nicene Creed, the Creed of the Councils and of the Holy Fathers of Constantinople. The resurrection of Christ is abundantly proclaimed by all the Church. Some of the modernising scholars, who don’t need to be named, have endeavoured to make the Resurrection a motif, rather than an event. The major claim of course here surrounds the empty tomb. In one way it is correct, the empty tomb proves nothing, the empty tomb allows other options, that Christ was not dead, simply exhausted and recovered in the coolness of the tomb and left, or that someone came along and stole the body away. The first claim is refuted in the Gospel accounts where the lance presses the side of Jesus and immediately there came out blood and water. This message indicates that he had been dead long enough for coagulation to have occurred. We symbolically remember this at the Holy Eucharist where wine and water are commingled - not because we want to make it go further, but because we are proclaiming the faith of the Church! The second claim is also reasonably refuted, as if someone else had stolen the body they would have produced it, or declared the disposal site to bring an end to the message of the disciples. If it had been the disciples, then their cowering until the day of Pentecost makes no sense at all. None the less it was the repeated encounters with the Risen Christ that convinced the apostles that he was indeed Risen from the Dead. In a sense their faith rests, as does our faith, it is the conviction of the Risen Christ that impels us to faith. For the writers of the articles it was clear that the body was laid in the tomb, then Christ descended into hell without the body, and on return put on the body again that he might carry our humanity into heaven, as surely as he had carried his divinity in our humanity. It seems to me that the witness of John 20:27 is very much in mind of the writers as they composed this article. There is no hint of Jesus being a ghost, or a ‘spiritual resurrection’ or some trick of mind. Resurrection here is flesh and blood. There has been a strong separation in parts of the contemporary Church between the Resurrection and the Ascension. Whist in one sense they are different, they are strongly connected and mark a singular process and direction, as the article clearly expresses for us. The Ascension gives rise to Jesus sitting in heaven. This of course is the Kingdom motif, long before there was a festival of Christ the King. Jesus does not simply disappear into heaven, Jesus rules, he sits as a King sits. On the last day he will return to judge all people. One of the thing we can struggle with a bit is the way we think of time. The ancient view was there was a day when time began, and when it has run its course there will be a day when time ends. The contemporary view of time is to see time stretch back infinitely, and stretching forward infinitely. We struggle a bit with the earlier concept. I find it helpful to think about the points at which time meets eternity. For me there seem to be three distinct events of this character, the is creation, judgement, and the life of Jesus Christ. Christina and DivineOfficeNerd like this. Article 5 sets before us the Anglican position on the procession of the Holy Spirit. Clearly here the article accords with the western expression of the Nicene Creed. The argument for procession has been long argued, and the theological position taken here is the position of Augustine of Hippo and Thomas Aquinas, and indeed the Roman Catholic Church. Augustine argued this position at a time and in an area where there was a deal of controversy through the heresy of pneumatomachi which taught erroneously that the Holy Spirit was a creation of the Son, therefore a creature, not divine. The position in the Nicene Creed at Constantinople was very strong against this, affirming the position taken by the Cappadocian Fathers that the Holy Spirit proceeds from the Father, as the Son is Begotten of the Father, and that both are eternal, pre-existent, and divine. Augustine saw, and sought to give expression to the Scriptural evidence (John 20.22) where Jesus breathed on the disciples and said ‘Receive the Holy Spirit’. Augustine is very certain that in every case the origin of the Spirit absolutely is the Father, yet understands that our encounter with the Holy Spirit may be through the ministrations of the Son. Thomas Aquinas was of course writing some time after the Great Schism, and he too is very careful in his discussion to make clear that the Holy Spirit, even when processing from the Son always processes in the first instance from the Father. One of the reasons it is important to be clear in our minds about this, is that being unclear here can cause awkward understandings of the Spirit moving on the water at Creation, the Spirit of the Most High overshadowing Mary the Mother of Jesus in the Incarnation, and the authentication of the mission and person of Jesus as the Holy Spirit descended at his Baptism in the River Jordan. It should also be said that it is important your understanding of the Procession of the Spirit is no sense hierarchical. The Spirit is not subservient to the Son - they are both coequal and coeternal with the Father. This leads us into the next part of the article next underlines and underscores the divinity of the Holy Spirit, as the absolute expression with the Father and the Son the absolute fullness of God - the very and eternal God. This will of course also remind you of the first article, as it should. The first five articles have dealt with the nature and being of God in three persons, which represents the core essence of who we believe in. In a sense the first five articles may be considered the least controversial. They ask nothing that is not essentially understood in the Nicene Creed (allowing for the issue of the Filioque). They establish the Anglican Church as a right believing (orthodox) community of faith, in line with the whole (catholic) Church. 1. What are the Anglican and Orthodox dialogues saying on the filioque? 2. Does the Anglican Church have a position now on the filioque's recitation in Church? 3. The debate in the early Church on whether the Holy Spirit was in a sense Jesus' "mother" and could be called such? 4. The scriptural reasons that opponents of double procession give (Am I allowed to cite Eastern Orthodox materials on this thread?) for their position. 6. The explanations of the Anglican commentaries from the 16th and 17th c. on Article 5. 7. Could you link to any essays that you have written on the filioque? After all, you are Anglican and a good researcher, so I think that your materials could be considered here and helpful. "the Holy Spirit proceeds from the Father, as the Son is Begotten of the Father,"
"processing from the Son always processes in the first instance from the Father." That is, you are saying that initially the Spirit proceeds from the Father, but at some point later it could for some reason proceed from the Son too. Is this what you are trying to say in accordance with John 15? That is, the Spirit proceeds from the Father, and the gospel says that God sent it onto Christ at His baptism, but afterwards Jesus sent it onto others, and so in that sense it proceeds from Christ too? I think that the general tenor of Anglican Orthodox dialogue has been consistently to stop inserting the Filioque. I believe that the current dialogues have stopped discussing this point, and are currently (I believe) discussing the theology of the human person, or theological anthropology. The Anglican Church does not hold positions. The Lambeth Fathers have three times suggested to member churches (all of which at autocephalus) that they consider the matter as the revise liturgies. Some have, Some have provided options, and some have not. Those Anglican Churches not in Communion with the Archbishop of Canterbury also make their own decisions, and my feeling is that though many of them have discussed it, I think the general tenor is to accept the Nicene Creed as it was printed in the 1661-2 Prayer Book. I have been conscious of some of that debate - and though I do believe that is an interesting topic of conversation I am not sure that it belongs here, as Article 5 presumes neither feminine, masculine or neuter gender of the Holy Spirit. I have cited the two Western Fathers who are the strongest proponents of double procession, and many of those who have followed them have missed the point, which in all fairness I think I have underlined above. The Eastern Fathers do say much, I think perhaps Basil On the Holy Spirit is one of the most interesting, in that he seems to wander towards such a place, and pulls up short. Some of that may have to do with the pneumatomachi whom they were keen to set straight. I would be happy for a couple of Eastern References, so long as they do not loose sight of Article 5. I think Article 5 is Cranmer's position, with perhaps a little of Matthew Parker. I don't have any great expertise on the commentaries, though I have read Ellis on this article, however I have not quoted him here. I do not think my essays on the Filioque belong here. This article, though clearly having borrowed in part from the language of the Nicene Creed in the western format is about procession. Most of the discussion of the Filioque belongs either in a discussion of the Nicene Creed, or given the impact of the clause, perhaps in it's own proper discussion. Everybody uses John 15 to prove their case. I have merely laid the basic case put by Augustine of Hippo and Thomas Aquinas which is that even when the Spirit proceeds from the Son, the Spirit always proceeds from the Father. I think some writers have tried to suggest that the Spirit can only proceed from the Son, and I don't think that was the position of this article, and indeed there are in my humble opinion a number of problems that such an approach can create, including an awkward creation, an awkward annunciation, and awkward baptism, and I think in part it contributes to a theology that ends up saying "extra Ecclesiam nulla salus" which runs the risk of the Church telling God what to do, when I think the Church should be trying to do what God tells us to do. I understand that many in the western tradition hold this position, and I realise that post Vatican II they have been more circumspect about it, however I certainly think the articles intend not to embrace that theology. Getting this grounding in the doctrine of the Holy Trinity in order is important. I think that is part of why the first five articles address it. The relevance I see is that it would make the Spirit an originator of the Son, rather than the other way around, if one considers the Spirit to be Christ's mother. I would be happy for a couple of Eastern References, so long as they do not loose sight of Article 5. The Eastern theology of the single procession of the Spirit articulated by Gregory of Nazianzus, followed the dogmatic statement of john 15:26.... Gregory argued that procession is the proprium of the Spirit just as Sonship is uniquely characteristic of the Son's hypostasis. The Son issues from the Father by manner of generation, just as the Spirit issues from the Father by manner of procession. .... the Son expressing the Fath's nature, now his own, as filiated hypostasis, and the Spirit expressing it as processed hypostasis. The single procession of both Son and Spirit from the Father alone thus preserved theChristian sense of one supreme Godhead. For the Greeks the association of the Son with the causation of the divine hypostasis of the Spirit, a factor not always or necessarily intended by the Latin procession of the filioque was a disruption to the very coherence of the doctrine of the Trinity and was regarded as a very serious matter... the creedal statement was referring to the emanation of the hypostases within the eternal life of the Godhead. Even so the concept of the Spirit proceeding from the Father "through the Son" was known in the East. In 867 the patriarch Photius came across the filioque in the context of a dispute with Latin missionaries in Bulgaria. he examined the doctrine and at a council in Constantinople in 879-880, with delegates present from Pope John VIII, the notion was condemnded. .... in 807, Latin monks introduced it into their liturgical practice at their monastery on the Mount of Olives,., The Patriarch of Jerusalem, alerted by monks introduced it into their liturgical practice at their monastery on the Mount of Olives. The patriarch of Jerusalem, alerted by monks from St Sabas, immediately protested the practice to Pope Leo III, maintaining that it was an unauthorized change to a conciliar statement, that is professed dubious doctrine. The Pope issued a decision defending the orthodoxy of the filioque doctrine... [and] refused to allow the addition of the clause in the Roman liturgy and advised the Frankish and Spanish churches gradually to discontrinue their innovatory practice. - the property that distinguishes the Spirit is that He proceeds from the Father. What is common to the Father, to the Son and to the Holy Spirit is the divinity or uncreated nature. (What is common to the Son and to the Holy Spirit is to have their origin form the Father.) The attribute proper to the Father is to be unbegotten, generation is proper to the Son and procession is proper to the Holy Spirit. The Father, the Son and the Holy Spirit are one in all things, except for being unbegotten, for being begotten and for proceeding. The three hypostases differ from one another merely in these personal properties, but not in their essence. ...that the Holy Spirit proceeds from the Father and from the Son (filioque), constitutes..., a trinity that has not been revealed, a speculative, philosophical trinity. He goes on to write in more detail on the topic, talking about Augustine and Aquinas. I would be interested in your opinion on his essay. How do you view these positions? As I understand it, you are saying that to state that the Spirit proceeds from the Son, you are not talking about its generation, birth, or formation in the same way that the Son and Spirit both originate in the Father. Thus I see you arguing that Article 5 is compatible with these Eastern understandings.